My name is Dave Drummer and I have been with the Hruska Clinic™ since 2006, and in 2011 I earned my PRC (Postural Restoration Certified). I feel quite lucky to be a part of this staff as I consider the other therapists here to be among the best in our profession. More than that, the people I work with are like family, which creates a great work environment. My journey towards becoming a physical therapist is not very typical as I was 31 years old when I returned to college, and 35 when I began my Doctorate of Physical Therapy education at the University of Nebraska Medical Center. Prior to this, I grew up on a farm in the middle of Iowa. After high school, I had aspirations of becoming an architect, so I moved to Lincoln in 1986 where I attended classes at the University of Nebraska. After about two years I realized that this was not the career path for me, so I entered the blue-collar work force, holding a variety of jobs from factory work to construction, as well as working ten years for the local gas utility company. Shortly after turning 30 I decided I was ready for a career change where I could make a difference in people’s lives. With my wife’s encouragement and support, I returned to college to become a physical therapist. For the next 5 years I worked full-time and took night classes at both Southeast Community College and the University of Nebraska. During this time, I had a need for physical therapy myself, and having heard about the Hruska Clinic™, began treatment. I was so impressed with the care I received that I knew this was where I wanted to work. Fortunately, about the time I was getting ready to graduate, there was a need for an additional therapist here, and I was offered the opportunity to join the staff, practice PRI, and really make a difference for my patients. I have enjoyed my time here immensely, and can’t imagine working anywhere else. On a personal note, my wife Elaine and I were married in 1995. 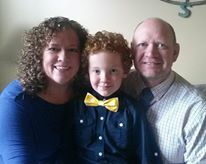 In July of 2009, our son Grant was born and he has been the highlight of our lives. Also, we have one cat that thinks she is one of our kids as well. Elaine makes custom children's clothes and has her own shop on ETSY called Doodlebugs & Drumsticks. To email Dave, click here.